Top Shelf to Publish "God is Disappointed in You"
What Does the Purchase of Top Shelf by IDW Mean? Top Shelf Announces "Monster on the Hill"
Top Shelf Comix Announces Release Date for "March"
Portland writer Mark Russell and award-winning cartoonist Shannon Wheeler have created a book that must be seen to be believed! 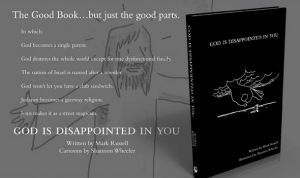 GOD IS DISAPPOINTED IN YOU is the "condensed" version of the Bible you never knew you needed -- hilariously modern, but surprisingly authentic -- published as a deluxe Bible-style hardcover with all the trimmings! We can't wait to get this very funny book into people's hands. A cynical and witty condensed version of the Bible, frequently hilarious, often shocking, but always faithful. With illustrations and gags by New Yorker cartoonist Shannon Wheeler. Presented as a deluxe textured hardcover, printed in two colors, with gilded edges & satin ribbon!